Ford Australia has teased the look of its 2019 Mustang Supercar as anticipation of the car’s track debut continues to build. The Blue Oval’s official social media accounts have released a render of the Supercars-spec Mustang, complete with bonnet vents. 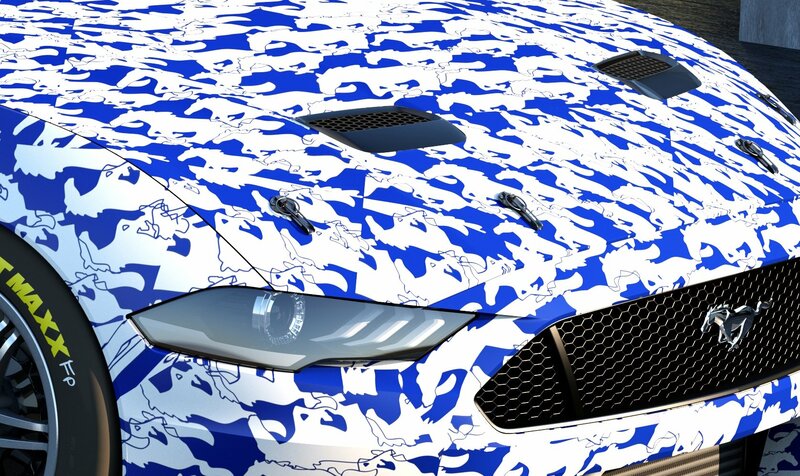 The car is depicted with a blue and white camouflage colour scheme, sitting on Supercars’ control wheel and tyre package. Ford’s Falcon Supercar replacement has been under development in Australia and the United States since the project was announced in April. Homologation team DJR Team Penske and US-based Ford Performance have led the work, with input also coming from Ford Australia’s design department and Tickford Racing. Although yet to be confirmed, the car’s track debut is expected to be just weeks away, ahead of official homologation testing in December. Seven Mustangs are expected on the Supercars grid in 2019 – two from DJR Team Penske, four from Tickford Racing and one from 23Red Racing. Ford has released the teaser image ahead of the Supercheap Auto Bathurst 1000, where the Falcon’s heritage is being celebrated. The car company has sent two classic Falcons – a 1967 XR GT and 1968 XT GT – from its heritage collection to be part of a tribute in the Supercars paddock. Ford’s presence at the event also includes a three-car speed comparison between its GTE Le Mans racer, a Falcon Supercar and its Mustang GT4. Ford Australia’s Product Communications Manager, Damion Smy, said the Mustang teaser has been issued to give fans a taste of what’s to come. “We’ve got a strong Ford and Ford Performance presence this weekend at Mount Panorama with the GT, the Mustang GT4 and the FG X Falcon heading around in the speed comparison,” he said. It remains unclear when the first Mustang Supercar will break cover, with Ford keen to keep it under wraps for now. “Obviously its first race will be the first race in Adelaide in March next year, but we will reveal it before then,” said Smy. “The program is on track in terms of timing and we’ll have a bit more to show further down the track.